Models have been persistent in developing a low in the northern gulf of mexico this weekend into next week. Regular updates will start when appropriate. The low is still expected to develop south of Louisiana Friday / Saturday and drift west toward the south Texas / northern Mexico coast several days after that. This is a major change from the models that suggested it would develop off of the Louisiana coast and drift toward the northeast Gulf. At 9 pm edt Lee was centered at 26.4 N / 91.7 W or about 250 miles sw of the mouth of the Mississippi River. Top sustained surface winds 35 mph (NHC 35 mph last advisory). Movement northwest at 2 mph. Pressure estimated at 1007 mb. Residents of the Gulf coastal states should keep an eye on TD 13 (Lee). Flooding rainfall is a big concern not only on the coast but hundreds of miles inland. The forecast calls for TD 13 to move generally toward the coast of Louisiana the next several days, slowly strengthening. TD 13 continues to be lop-sided. A large plume of showers and storms are on the eastern semi-circle of the low. This will allow the heavier rainfall to move over Louisiana and locations east of the low. It's possible that some of the rain may wrap around toward the upper Texas coast also. At this time the primary concern is for very heavy rainfall over the next several days. Winds will also become a concern, especially on the Louisiana coast as TD 13 gradually strengthens. At 5 am edt Lee was centered at 26.5 N / 91.7 W or about 240 miles sw of the mouth of the Mississippi River. Top sustained surface winds 35 mph (NHC 35 mph last advisory). Movement northwest at 2 mph. Pressure estimated at 1006 mb. The forecast calls for TD 13 to move slowly north generally toward the coast of Louisiana the next several days. With the low being offshore over very warm water its possible that this tropical cyclone could reach hurricane strength before landfall. Some forecasts models don't have the low coming inland as the hurricane center's official track, but meander the center of the low near the coast before it moves inland early next week. The hurricane center officially upgraded Lee this afternoon as convection continues to grown and a low level circulaton strengthens. Lee is still lop-sided with a plume of tropical moisture on the eastern half of the circulation. Rainfall in excess of 10" is possible as Lee will move slowly into the Gulf coastal states. The forecast models take some of the moisture up the Tennessee Valley and another east of the Appalachains. 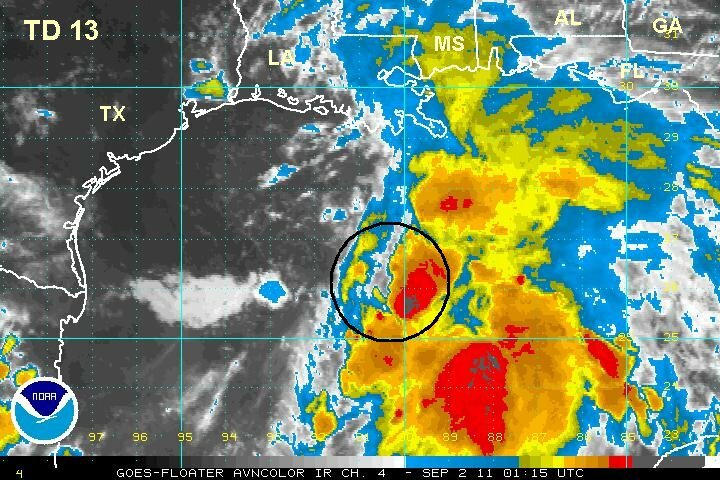 At 5 pm edt Lee was centered at 27.5 N / 91.5 W or about 185 miles sw of the mouth of the Mississippi River. Top sustained surface winds 45 mph (NHC 45 mph last advisory). Movement north at 2 mph. Pressure estimated at 1002 mb. Residents of the Gulf coastal states should keep an eye on Lee, especially Louisaina and Mississippi. Flooding rainfall is a big concern not only on the coast but hundreds of miles inland. The forecast calls for Lee to move slowly north northeast toward the coast of Louisiana the next few days. With Lee being offshore over very warm water its possible that this tropical cyclone could reach hurricane strength before landfall. 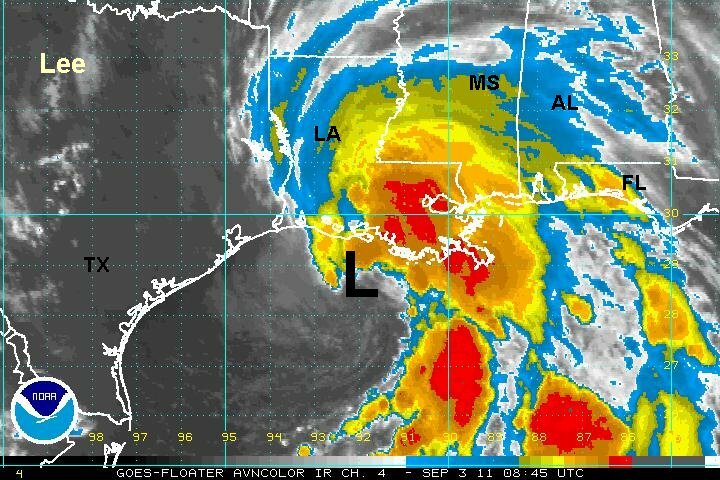 Lee is now forecast to move inland Sunday morning before stalling over Louisiana. This small amount of time over water will curtail development. 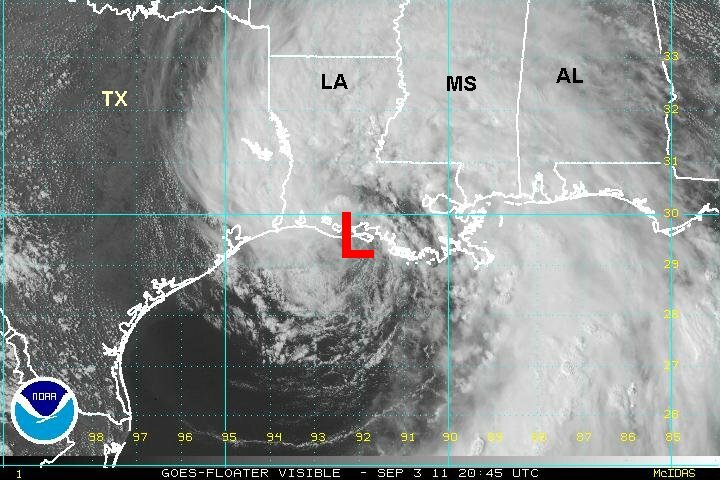 Lee is just offshore of the central Louisiana coast and will make landfall by later this morning. Winds on the central and southeast Louisiana coast are generally 45-50 mph with higher gusts. Offshore buoys / oil rigs are reporting seas 12-16 feet with some gusts around 65 mph. Rainfall totals of 6-8" have been estimated on the southeast coast with heavy rain continuing over eastern Louisiana. 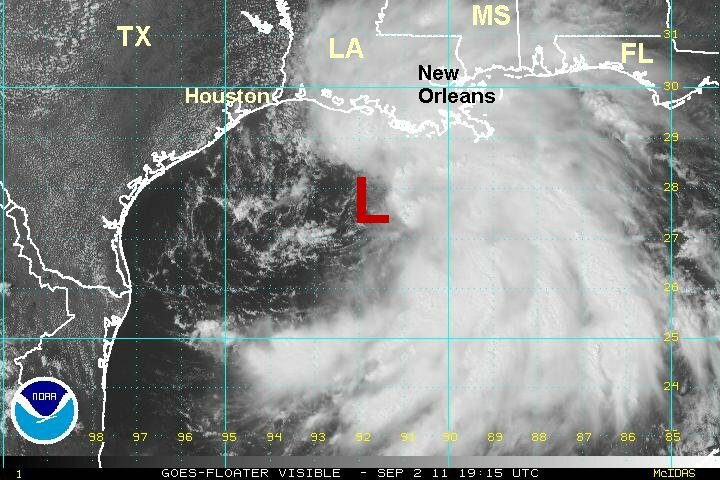 At 8 am edt / 7 am cdt Lee was centered at 29.4 N / 92.0 W or about 15 miles sse of Intracoastal City, Louisiana. Top sustained surface winds 60 mph (NHC 60 mph last advisory). Movement nnw at 7 mph. Pressure estimated at 995 mb. Flooding rainfall is a big concern not only on the coast but hundreds of miles inland. The forecast takes Lee slowly northeast across the gulf coastal states the next few days bringing the threat of flash flooding. Lee has made landfall on the marshes of southcentral Louisiana. Winds don't seem to be quite as strong so I'm dropping the winds a touch. Buoy's are reporting winds generally 30-40 mph with gusts to 55-60 mph. It's possible some of the stronger gusts are well offshore south of the mouth of the Mississippi river. Rainfall totals of 3-6" have been estimated over eastern Louisiana with 6-9" on the southeast coast with heavy rain continuing over eastern Louisiana. At 10:30 am edt / 9:30 am cdt Lee was centered over the Russell Sage Foundation Marsh in southcentral Louisiana, south of Lafayette on the coast. Top sustained surface winds 55 mph (NHC 60 mph last advisory). Movement nnw at 7 mph. Pressure estimated at 995 mb. 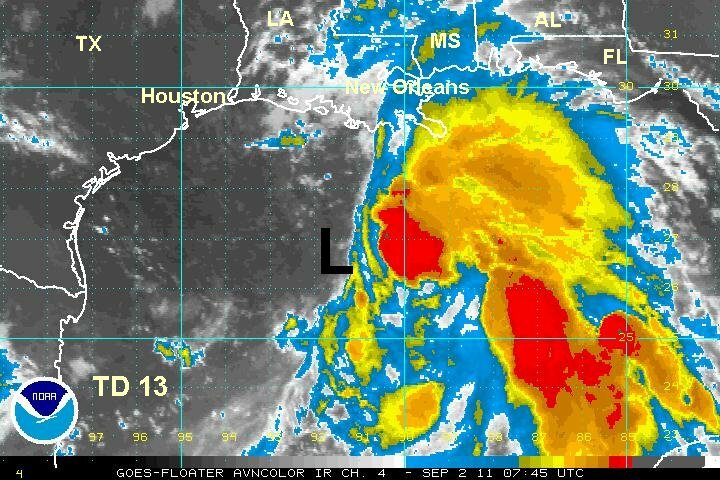 Lee has stalled on the southcentral coast of Louisiana. 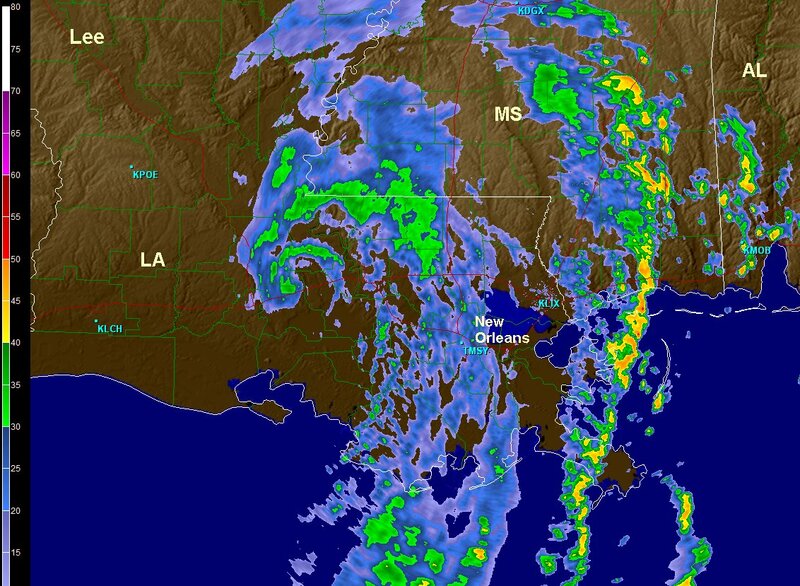 Lee stalled just as it touched the marshes of southcentral Louisiana this morning. A series of vorticies have rotated around a larger center of circulatiion on the coast. Rainfall totals of 2-5" have been estimated over most of eastern Louisiana eastward to the coast of Mississippi and Alabama. 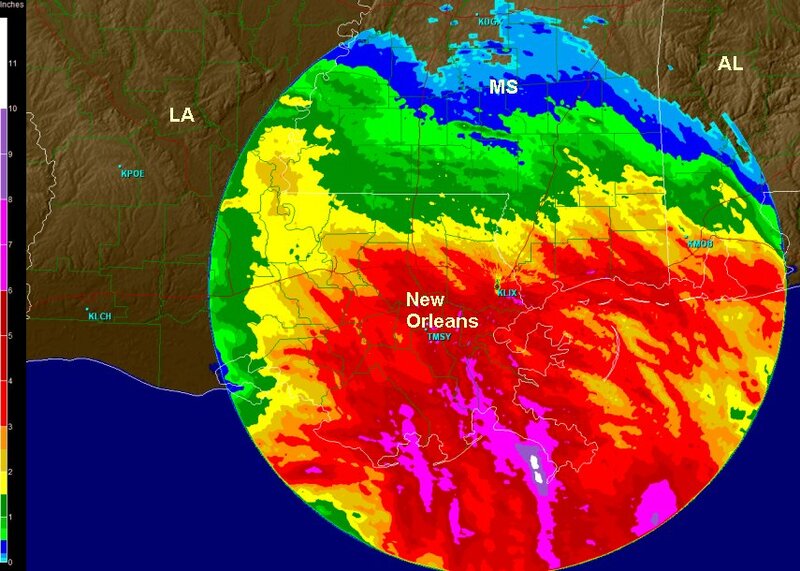 Rainfall estimates of about 10" are located in southeastern Louisiana. 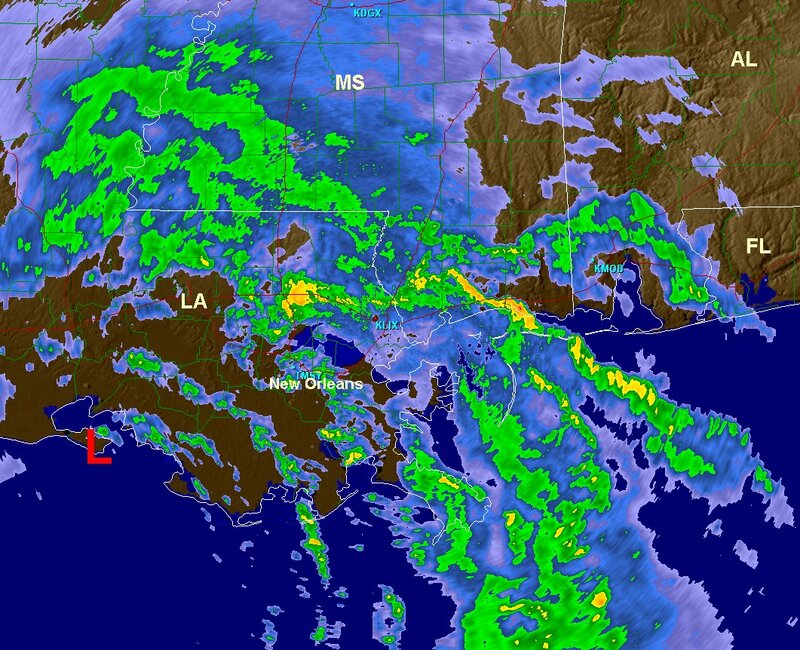 Currently the heavier rainfall is moving into southern Louisiana and Mississippi. At 5:00 pm edt / 4:00 pm cdt Lee was centered over the Russell Sage Foundation Marsh in southcentral Louisiana, south of Lafayette on the coast. Top sustained surface winds 55 mph (NHC 60 mph last advisory). Movement north at 4 mph. Pressure estimated at 989 mb. Flooding rainfall is a big concern not only on the coast but hundreds of miles inland. A band of 3-6" of rain will develop over Mississippi, northern and central Alabama into north Georgia and the eastern half of Tennessee. The heavy rainfall will progress up the Appalachians over the next several days. Lee has drifted offshore again. It is about 50 miles south of the coast now. Radar shows a well defined circulation. Convection is building on the west side of the circulation and further strengthening is possible. 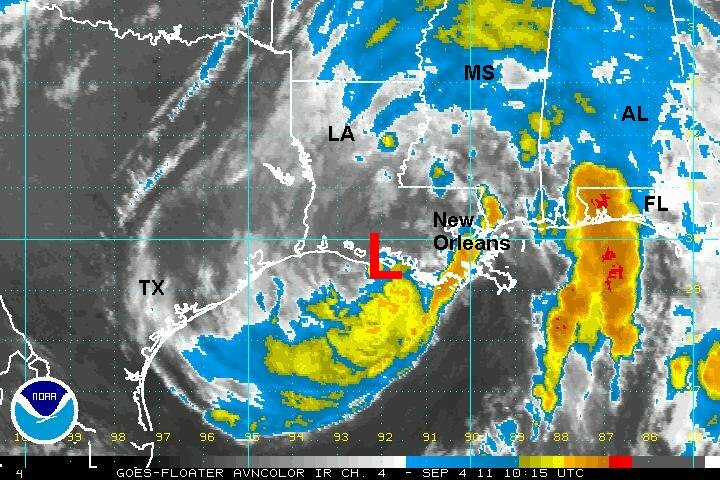 After drifting back over the Gulf for over 12 hours, Lee has again moved north onto the coast of southcentral Louisiana. Deep convection has built on the southside of the center of circulation in an attempt to restrengthen. It doesn't appear that Lee has changed much in intensity since last evening. Buoy's south of Louisiana are still gusting to over 55 mph with seas 11-12 feet. Satellite and Radar imagery show that a plume of tropical moisture - very heavy rain is setting up over the western panhandle of Florida. This heavy rain is forecast to develop into eastern Alabama and northern Georgia today and tonight. 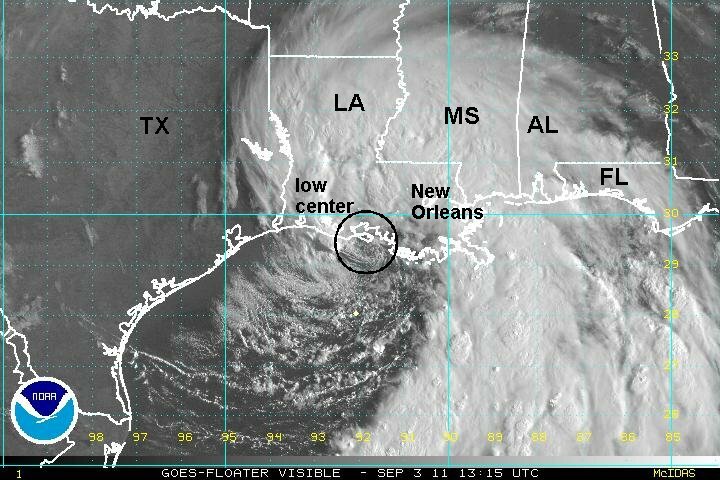 At 7 am edt / 6 am cdt Lee was centered just southeast of Intracoastal City, Louisiana. Top sustained surface winds 50 mph (NHC 45 mph last advisory). Movement north at 2 mph. Pressure estimated at 987 mb. Most forecasts take Lee slowly northeast across the gulf coastal states the next few days bringing the threat of flash flooding. Another forecast model actually takes Lee back out into the Gulf and into into northern Mexico. Right now I (and NHC) are not buying this scenario. 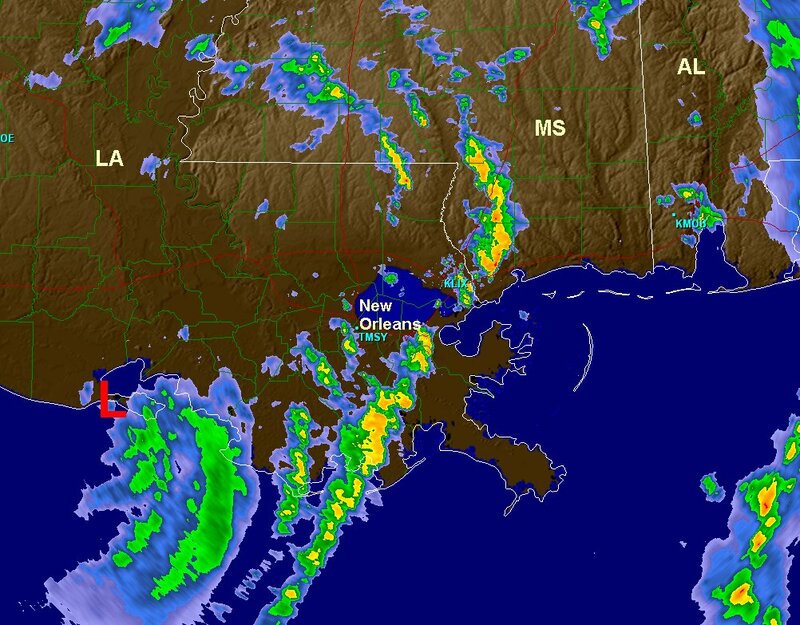 Lee is over central Louisiana and is weakening. A threat for flooding rainfall will continue over the Gulf coastal states. 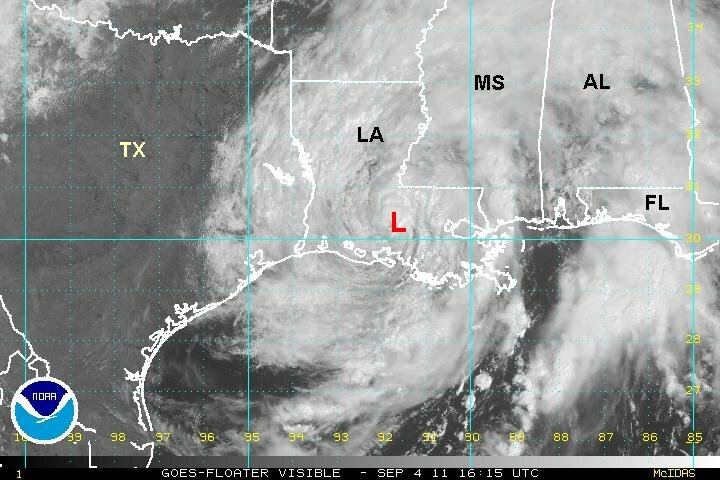 At 1 pm edt / 12 pm cdt Lee was centered about 25 miles northeast of Lafayette, Louisiana. Top sustained surface winds 40 mph (NHC 45 mph last advisory). Movement northeast at 3 mph. Pressure estimated at 986 mb. Lee is expected to move northeast slowly over the next several days. This will be the last update on Lee. Rainfall from Lee spread across the northern Gulf coastal states producing widespread totals of 3-6" from northwest Georgia, much of central and eastern Tennesse, northern Alabama and much of Mississippi. Totals over 8" were estimated by doppler radar in northeastern Mississippi.